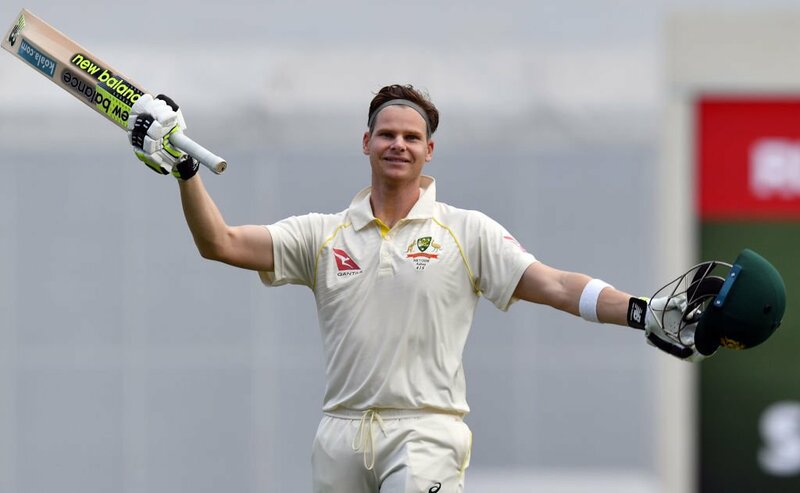 Brisbane, Nov 25: Captain Steven Smith's 141 not out gave Australia a slim 26-run first-innings lead before they removed two England batsmen for 33 runs in their second innings on the third day of their opening Ashes cricket Test at the Gabba here on Saturday. Resuming the day at 165/4, Smith cracked his 21st Test century as Australia were bowled out for 328, gaining a small over England's 302. Batting in his 105th Test innings, Smith became the third quickest batsman to register 21 centuries. Australian legend Donald Bradman holds the record in 56 innings. while former India captain Sunil Gavaskar reached 21 centuries in 98 innings, Sachin Tendulkar did it in 110 innings. The world's top-ranked Test batsman Smith shared a a decisive partnership of 66 runs for the eighth wicket with Pat Cummins (42). Resuming the day 165/4, Australia were reeling at 209/7, losing overnight batsman Shaun Marsh (51), Tim Paine (13) and Mitchell Starc (6). Paceman Stuart Broad first removed Marsh, who drove into the hands of James Anderson at mid-off. Anderson then forced an edge of Paine for a regulation take for wicket-keeper Jonny Bairstow. Broad then scalped Starc with a return catch as Smith watched his side losing wickets at regular intervals. Smith then found an abled partner in Cummins and the pair saw off the danger from Broad and Anderson. They showed a lot of resillience and patience and after having spent some time at the crease, they were comfortable against the likes of Jake Ball and Chris Woakes. Veteran Anderson also struggled with fitness and that played into the hands of Smith-Cummins pair. The pair remained resolute for more than two hours, during which Smith completed his century as he drove Broad past mid-off for a four in his 261st delivery faced. with Cummins posting a Test career-best score of 42 before he edged to Alastair Cook at slip off Woakes, as Australia lost their eighth wicket for 275 runs. During the stand, Cummins outscored Smith who eked out 23 during that same period. Smith continued to foil the visiting bowlers as he single-handedly enabled Australia to score past 300. England, in their second essay, had a disastrous start, with seamer right-arm Josh Hazlewood removing veteran Cook (7) and James Vince (2) to give Australia big hopes. Captain Joe Root (5 not out) and opener Mark Stoneman (19 not out) will begin the fourth day's play for England, with the tourists having a seven-run lead. Brief scores: England: 302 and 33/2 (Mark Stoneman 19 not out; Josh Hazlewood 2/11). Australia: 328 all out in first innings (Steven Smith 141 not out, Shaun Marsh 51, Pat Cummins 42; Stuart Broad 3/49, James Anderson 2/50, Moeen Ali 2/74) on Day 3.